Style chic et décontracté se marie parfaitement avec tous vos vêtements, en cuir souple et confortable.Produit de l'artisanat marocain. Menara color red slippers, leather slippers for men, ultra resistant made entirely by hand by Moroccan artisans. 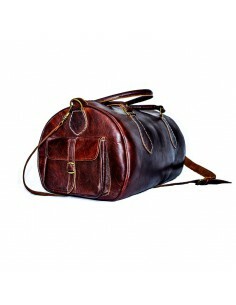 all our models are genuine leather. 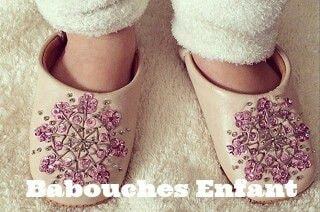 Babouchestore shop N ° 1 online sale of babouche for women, children and men. 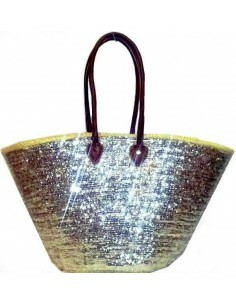 We also offer a wide selection of Moroccan crafts and leather goods, bags, poufs, travel bags 100% natural leather. Let yourself be seduced by your favorite product, delivery is free! 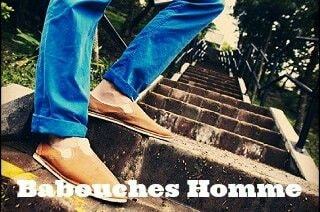 Moroccans and Moroccans all have a pair of slippers. 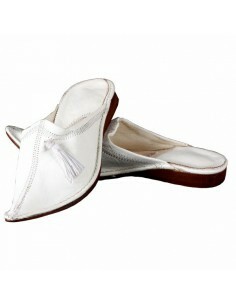 Moroccan slippers is a craft shoe from a secular tradition. They are worn by Moroccans for centuries and are still popular today for their comforts, their styles and are a must for many traditional Moroccan festivals. They are still crafted by passionate Moroccan craftsmen who pass on a unique knowledge of generations to generations. The essential element is undoubtedly the know-how of the craftsman who can spend up to ten hours to manufacture a pair of traditional Moroccan slippers. The top of the slipper (the covering part) is most often made of goatskin. The Babouchier buys his leather in tanneries where the skins are worked there also according to ancestral rites, in particular in the tanneries of Fez known all over the world. The inner part, in contact with the foot is usually sewn goatskin. 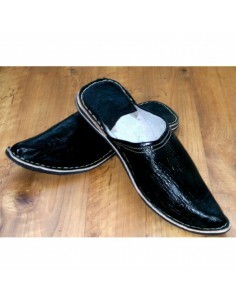 The outer part, in contact with the ground is made from calfskin more resistant. The pouf is found in all Moroccan salons without exception. This small comfortable and practical seat takes its name from Arabic, pouf means a cushion without armrests and without backrest. The presence of an ottoman in a salon is synonymous with conviviality and sharing even if it is most often intended for the youngest. 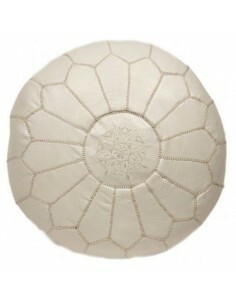 Moroccan poufs are distinguished by the quality of leather used by craftsmen. Indeed, like all Moroccan handicrafts the craftsman who also makes slippers is part of a large chain of crafts because the leathers used are transformed in Moroccan tanneries who still use, today, a know-how globally recognized for centuries. The skins of Moroccan leather poufs are also dyed with natural pigments from plants or natural resources which allows the artisan to have an infinite choice of texture and colors of premium leather to design more poufs original ones than the others. 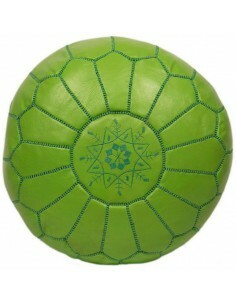 There are poufs of round shapes, square, rectangular, oval .... everything is possible. More and more craftsmen realize in parallel lines of ottomans with the forms and the traditional colors and more resolutely more modern lines which marries perfectly with our western interiors. Leather goods are closely linked to Moroccan history, this word from "morocco" refers to leathers from goat and goat skins whose processing, that is to say, tanning has been perfected in Morocco. Moroccan craftsmen recognized throughout the world for mastering ancestral techniques, have succeeded in raising the tanning of leather to the rank of art in its own right. The quality of Moroccan leather is incomparable and very famous, that's probably why the luxury industry uses mainly processed leather in Morocco. 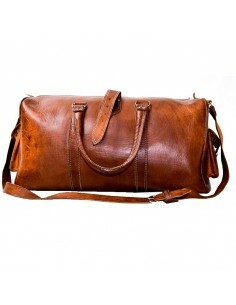 Leather goods is made up of a large number of craftsmen and makes a lot of people live in its cradle. 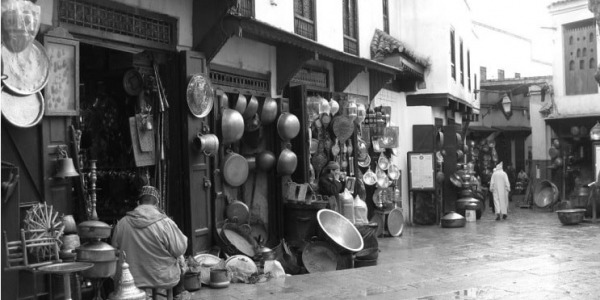 Leather has an important place in the Moroccan economy since time immemorial. The most famous city for the quality of its leather and for the delicacy of its craftsmanship, is undoubtedly Fes, imperial city with the unique and bewitching charm which seems freeze in the time. Yet it is a city of undeniable dynamism where artisans team up with young designers to create original collections of leather travel bags, leather bags, leather handbags, which combine ancestral know-how and modern designs. contemporaries. It is therefore natural that Babouchestore has decided to share the best of Morocco with babouches, wicker baskets, leather travel bags, leather poufs and quality Moroccan crafts for you or your home. .
To offer or to afford a little bit of Morocco! Ottoman Pouffe authentic Moroccan handmade real soft leather. The Moroccan pouf is so practical that it can be used as a foot stool, as a low seat next to your coffee table or in your room or for your children. 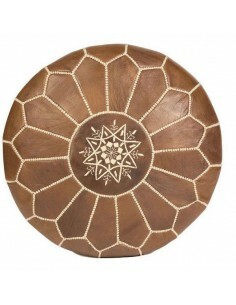 Moroccan Ottoman Pouffe are wonderful products of Moroccan handicrafts, leather used to sit. 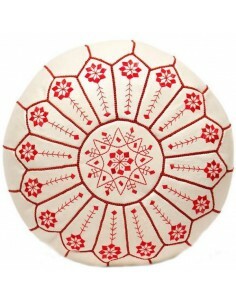 Moroccan ottoman round leather pouffes have many different uses. For example, it is an excellent foot stool or footstool and charming furniture or furniture; However, it is mainly used for seats. 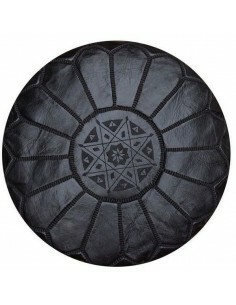 Our Moroccan leather poufs are made from full grain leather from the Marrakech and Fez tanneries. Each Moroccan pouf is unique, with subtle variations inherent in authenticity. 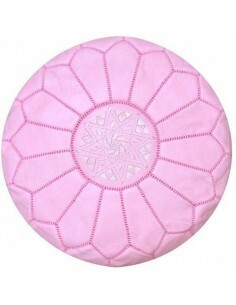 Moroccan pink leather pouffe are wonderfully comfortable in addition to quickly becoming a modern classic. The seat / stool / footrest and versatile, ideal for entry, living room, playroom, bedroom, or a child's room. Our round pouches in genuine leather and matching stitching.Each pouf has a star stitched on top. Moroccan Pouffe color Yellow, traditional model - the Moroccan yellow pouf is a useful and functional decoration element, the Moroccan pouf can be used as a stool, table or as a footstool. 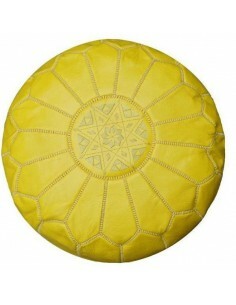 Simple to use and practical to decorate your interior, the Moroccan pouf is available in yellow but also in other colors. 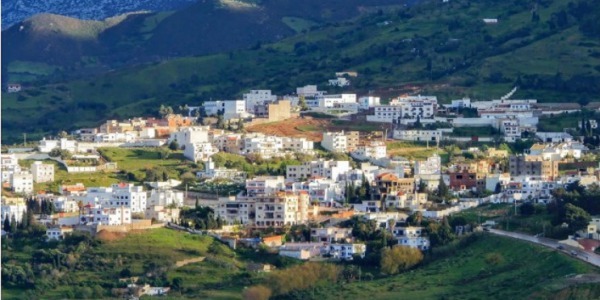 The craft sector in Morocco is one of the oldest and most important sectors of the kingdom, it combines all the traditional trades that have been handed down from generation to generation. Geographical location as well as ethnic and religious diversity have contributed to this incredible notoriety, rich and colorful craftsmanship. 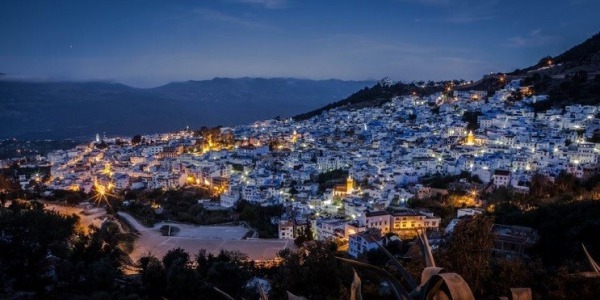 Each Moroccan city is known for its crafts, but you will find all kinds of handicrafts in cities like Fez, Marrakech and Meknes, as well as other cities like Essaouira and Safi. A quality and an irreproachable finish, Babouchestore rigorously selects the craftsmen to offer you the best quality and Moroccan craftsmanship. The skills of the Moroccan craftsman make the products aesthetic and robust, a work of Moroccan art. 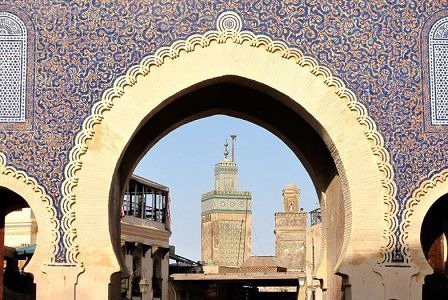 The Souks of Marrakech and Fez offer all kinds of crafts, manufactured inside the medina, you will see that it is divided into different parts each is specialized in a trade and specific product that makes shopping more fun. 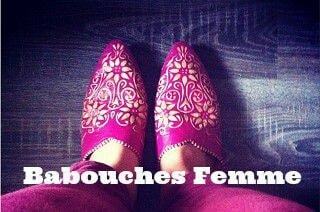 If you are always fascinated by the unique crafts of Morocco, you want to buy babouches, a fixture, a wicker basket or a leather bag visit Babouchestore you will find for sure babouche to your foot. Discover all Morocco with Babouchestore offer your favorite babouche & Moroccan crafts, our products are made entirely by hand. 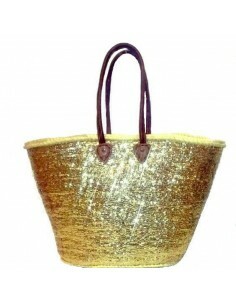 We offer a wide selection of Moroccan pouf, Moroccan crafts and leather goods, our prices are always very attractive. 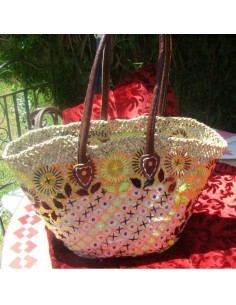 Wicker basket ideal for sunny days at the beach, large and convenient..
Nice wicker basket for your summer days on the beach, fully hand embroidered by Moroccan craftsmen . 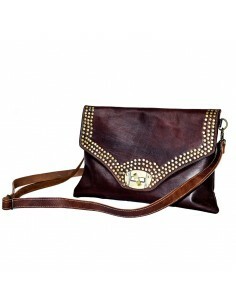 Leather Pouch - Samia with removable shoulder strap, decorate with gold studs and a twist clasp, hand made by Moroccan artisans.